In government, unicameralism is the practice of having one legislative or parliamentary chamber. Thus, a unicameral parliament or unicameral legislature is a legislature which consists of one chamber or house. The Constitution of Iceland is the supreme law of Iceland. It is composed of 80 articles in seven sections, and within it the leadership arrangement of the country is determined and the human rights of its citizens are preserved. The current constitution was first instituted on June 17, 1944; since then, it has been amended seven times. The current speaker of the Althing is Steingrímur J. Sigfússon. Steingrímur Jóhann Sigfússon is an Icelandic politician. He has been a member of the Althing since 1983 and was the founding chairman of the Left-Green Movement from 1999 until 2013. He was the Minister for Agriculture and Communications from 1988–1991. He became Minister of Finance in 2009. In 2011 he took on the roles of Minister of Fisheries and Agriculture and Minister of Economic Affairs. A thing was the governing assembly of an early Germanic society, made up of the free people of the community presided over by lawspeakers. The word appears in Old Norse, Old English, and modern Icelandic as þing, in Middle English, Old Saxon, Old Dutch, and Old Frisian as thing, in German as Ding, and in modern Norwegian, Danish, Swedish, Faroese, Gutnish, and Norn as ting, all from a reconstructed Proto-Germanic neuter *þingą; the word is the same as the more common English word thing, both having at their heart the basic meaning of "an assemblage, a coming together of parts"—in the one case, an "assembly" or "meeting", in the other, an "entity", "object", or "thing". The meeting-place of a thing was called a "thingstead" or "thingstow". Þingvellir, anglicised as Thingvellir, is a national park in the municipality of Bláskógabyggð in southwestern Iceland, about 40 km northeast of Iceland's capital, Reykjavík. Þingvellir is a site of historical, cultural, and geological significance, and is one of the most popular tourist destinations in Iceland. The park lies in a rift valley that marks the crest of the Mid-Atlantic Ridge and the boundary between the North American and Eurasian tectonic plates. To its south lies Þingvallavatn, the largest natural lake in Iceland. The Icelandic Commonwealth, Icelandic Free State, or Republic of Iceland was the state existing in Iceland between the establishment of the Alþingi (Althing) in 930 and the pledge of fealty to the Norwegian king with the Old Covenant in 1262. With the probable exception of Papar, Iceland was an uninhabited island until around 870. 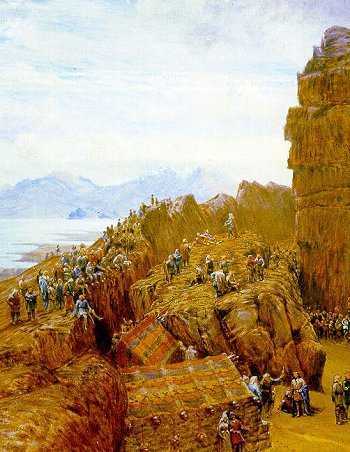 When the Icelanders submitted to the authority of the Norwegian king under the terms of the "Old Covenant" (Gamli sáttmáli) in 1262, the function of Althing changed. The organization of the commonwealth came to an end and the rule of the country by goðar ceased. Executive power now rested with the king and his officials, the Royal Commissioners (hirðstjórar) and District Commissioners (sýslumenn). As before, the Lögrétta, now comprising 36 members, continued to be its principal institution and shared formal legislative power with the king. Laws adopted by the Lögrétta were subject to royal assent and, conversely, if the king initiated legislation, Althing had to give its consent. The Lawspeaker was replaced by two legal administrators, called lögmenn. When Denmark was occupied by Germany on 9 April 1940 the union with Iceland was effectively severed. On the following day, the Althing passed two resolutions, investing the Icelandic cabinet with the power of Head of State and declaring that Iceland would accept full responsibility for both foreign policy and coastal surveillance. A year later the Althing adopted a law creating the position of Regent to represent the Crown. This position continued until the Act of Union was repealed, and the Republic of Iceland established, at a session of the Althing held at Þingvellir on 17 June 1944. While elections may be held every four years, they can be held more frequently due to extenuating circumstances. 1 2 "A short history of Alþingi - the oldest parliament in the world". europa.eu. The European Union. Retrieved 7 April 2017. 1 2 Meredith, Sam (28 October 2016). "World's oldest parliament poised for radical Pirates to takeover". CNBC. Retrieved 7 April 2017. ↑ Sigurðardóttir, Heiða María; Emilsson, Páll Emil. "Hvenær var Alþingi stofnað?". visindavefur.is. Vísindavefurinn. Retrieved 7 April 2017. ↑ "ALÞINGISHÚSIÐ - ÁGRIP AF BYGGINGARSÖGU ÞESS". Morgunblaðið. 24 April 1949. Retrieved 7 April 2017. ↑ Álvarez-Rivera, Manuel. "Election Resources on the Internet: Elections to the Icelandic Althing (Parliament)". electionresources.org. Election Resources. Retrieved 10 April 2017. ↑ "Stjórnarskipunarlög um breytingu á stjórnarskrá lýðveldisins Íslands, nr. 33/1944, með síðari breytingum". althingi.is. Alþingi Íslands. Retrieved 7 April 2017. 1 2 3 4 5 6 7 8 9 10 "Alþingi" (PDF). althingi.is. Alþingi. Retrieved 7 April 2017. ↑ "Lögberg -the law rock". thingvellir.is. Þjóðgarðurinn á Þingvöllum. Retrieved 7 April 2017. ↑ Karlsson, Gunnar (2000). The History of Iceland. p. 206. Look up Althing in Wiktionary, the free dictionary. The politics of Iceland take place in the framework of a parliamentary representative democratic republic, whereby the President is the head of state, while the Prime Minister of Iceland serves as the head of government in a multi-party system. Executive power is exercised by the government. Legislative power is vested in both the government and the parliament, the Althingi. The judiciary is independent of the executive and the legislature. The Storting is the supreme legislature of Norway, established in 1814 by the Constitution of Norway. It is located in Oslo. The unicameral parliament has 169 members, and is elected every four years based on party-list proportional representation in nineteen plurinominal constituencies. A member of the Storting is known in Norwegian as a stortingsrepresentant, literally "Storting representative". The Gray (Grey) Goose Laws are a collection of laws from the Icelandic Commonwealth period. The term Grágás was originally used in a medieval source to refer to a collection of Norwegian laws and was probably mistakenly used to describe the existing collection of Icelandic law during the sixteenth century. The Grágás laws in Iceland were presumably in use until 1262–1264 when Iceland was taken over by the Norwegian crown. Parliamentary elections were held in Iceland on 12 May 2007. The Independence Party remained the largest party in the Althing, winning 25 of the 63 seats. Parliamentary elections were held in Iceland on 10 May 2003. The Independence Party remained the largest party in the Althing, winning 22 of the 63 seats. Jóhanna Sigurðardóttir is an Icelandic politician and the former Prime Minister of Iceland. She became active in the trade union movement, serving as an officer. A parliamentary election was held in Iceland on 25 April 2009 following strong pressure from the public as a result of the Icelandic financial crisis. The Social Democratic Alliance and the Left-Green Movement, which formed the outgoing coalition government under Prime Minister Jóhanna Sigurðardóttir, both made gains and formed an overall majority of seats in the Althing. The Progressive Party also made gains, and the new Citizens' Movement, formed after the January 2009 protests, gained four seats. The big loser was the Independence Party, which had been in power for 18 years until January 2009: it lost a third of its support and nine seats in the Althing. Róbert Marshall is an Icelandic politician. In April 2009, he was elected as a Member of the Althing for the Reykjavik Constituency South, representing the Social Democratic Alliance (Samfylkingin). On 12 October 2012 he decided to leave his party, in order to become a new party member and top list election candidate for the newly founded party Bright Future in Reykjavik Constituency South. 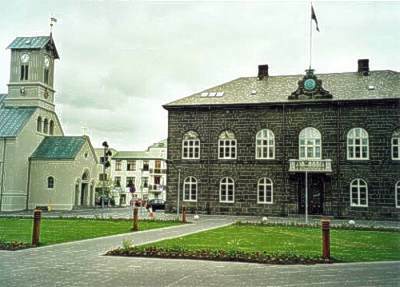 Parliamentary elections were held in Iceland on 24 June 1934. They were the first held after reforms to the electoral system that increased the number of seats in the Lower House from 28 to 33 and ensured that all members of the Althing were elected at the same election. The Independence Party emerged as the largest party in the Lower House, winning 14 of the 33 seats. An Icelandicparliamentary election was held on 27 April 2013. Fifteen parties contested the election in Iceland, compared to just seven in the previous election. The election was won by the two centre-right opposition parties, the Independence Party and Progressive Party, who subsequently formed a coalition government. The parties are eurosceptic, and their win brought to a halt partially completed negotiations with the European Union regarding Icelandic membership. The Pirate Party is a political party in Iceland. The party's platform is based on pirate politics and direct democracy. Jón Þór Ólafsson is an Icelandic politician. Salome Þorkelsdóttir, sometimes transliterated as Salome Thorkelsdottir, is a retired Icelandic politician and first woman to be Speaker of the unicameral Althing. Before that she had been Speaker of the Upper House of the Althing. She was of the Independence Party. The next Icelandic parliamentary election to elect members of the Althing will be held no later than 23 October 2021. Magnús góði Guðmundarson was a medieval chieftain (gothi) of Þingvellir in Iceland. He was the allsherjargoði of the Althing from 1197 to 1234. He inherited the office from his father Guðmundr gríss Ámundason, who was the descendant of Ingólfur Arnarson, one of the first Viking settlers on the island. Magnús was the next-to-last allsherjargoði before the dissolution of the Icelandic Commonwealth in 1262. He had no offspring, and contemporary sources only offer conjectures about his successor, possibly Árni óreiða Magnússon, nephew of Guðmundr gríss Ámundason and son-in-law of the skald Snorri Sturluson. In fact, the sagas narrate that Sturluson caused Magnús's fall: during his first term as lawspeaker, Sturluson convinced the Althing to outlaw (skógarmaðr) Magnús. Despite his title, Magnús was not one of Iceland's more powerful citizens. Áslaug Arna Sigurbjörnsdóttir is an Icelandic politician who is a member of the Althing for the Reykjavík North constituency since 2016 and deputy Chairman of the parliamentary group for the Independence Party. She has also served as the Secretary of the Independence Party since 2015.